Some chitons are surprisingly colorful. 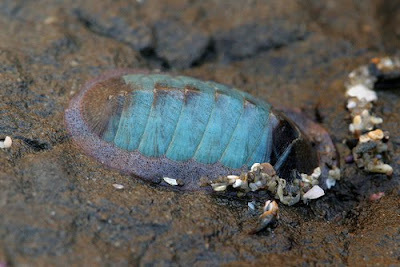 This is Ischnochiton virgatus from southern Australia, as photographed by Leon Altoff. In the familiarity stakes, chitons occupy the fourth spot among the generally-recognised mollusc classes after gastropods, bivalves and cephalopods (which is a little unfair as there are more living chiton than cephalopod species). 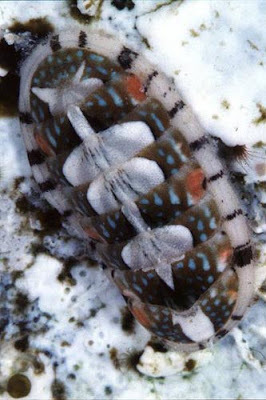 All living chitons share a similar general morphology with a central linear series of eight overlapping shell valves, surrounded by a fleshy girdle that (depending on species) may or may not be covered with small spicules. 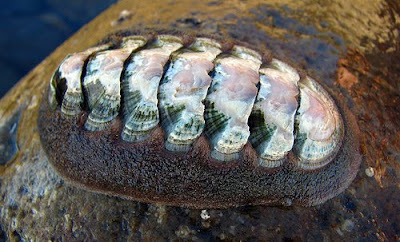 Like limpets, chitons live attached to marine rocks where they graze on algae. Go down to any rocky beach and you'll have no difficulty finding them in large numbers. A bright blue example of Lepidozona radians, photographed by Ron Wolf. The classification of chitons has been shifted around a bit in recent years. Earlier systems seem to have been based primarily on the morphology of the shell valves but more recent classifications have also looked at other features such as the soft anatomy (the most commonly cited reference seems to be Sirenko, 2006, but unfortunately I don't have access to it at present). The family Ischnochitonidae as recognised by Kaas & Van Belle (1985, 1987), for instance, has been divided into a number of families; Sirenko's Ischnochitonidae appears to be roughly equivalent to Kaas & Van Belle's subfamily Ischnochitoninae. Phylogenetic studies indicate that Ischnochitonidae in the older sense is para- or polyphyletic (for instance, in the tree of Wilson et al., 2010). Stenoplax conspicua is a large ischnochitonid, growing up to about ten centimetres long. Photo by J. P. McKenna. Kaas & Van Belle (1985, 1987) distinguished the Ischnochitoninae from other chitons by the lack of comb-like projections on the insertion plates (lateral extensions of the valves that anchor the valve in the surrounding girdle), slits present on the insertion plates but not corresponding in number or position to the radial ribs of the valve, and with smooth, sharp teeth on the insertion plates that are not thickened at the edges of the slits. The girdle is covered with scales. Ischnochitonids can be found at all depths, from the shoreline to the deep sea - Stenosemus chiversi has been recorded at a depth of over 4500 m (Schwabe, 2008). Kaas, P., & R. A. Van Belle. 1987. Monograph of Living Chitons (Mollusca: Polyplacophora) vol. 3. Suborder Ischnochitonina. Ischnochitonidae: Chaetopleurinae, & Ischnochitoninae (pars). Additions to Vols 1 & 2. E. J. Brill/Dr W. Backhuys. Schwabe, E. 2008. A summary of reports of abyssal and hadal Monoplacophora and Polyplacophora (Mollusca). Zootaxa 1866: 205-222. Sirenko, B. I. 2006. New outlook on the system of chitons (Mollusca: Polyplacophora). Venus 65 (1-2): 27–49. Is it bad that I thought this post would be about dinoflagellates before I read the taxon name? Bizarre critters. I saw many scale urchins in Hawaii two years ago, and thought they were chitons, but people corrected me. Are scale urchins really urchins? They don't look anything like a normal sea urchin. I've not heard the name 'scale urchin' before - do you mean something like this? Because that one is indeed an urchin (and if you look closely, you can see the five ambulacral rays). Yup! That's the critter! And yes, I see the rays. I imagine those tabs along the bottom are "feet?"